Published: Jan. 23, 2014 at 03:44 p.m. Updated: Jan. 24, 2014 at 08:26 a.m. The Cleveland Browns' winding coaching search has finally concluded. The Browns announced Thursday that Mike Pettine has been hired as the team's next head coach. Pettine, most recently the Buffalo Bills' defensive coordinator, cut his teeth working under Rex Ryan with the Baltimore Ravens and New York Jets. Cleveland's search began mere hours after the 2013 season ended when the team fired Rob Chudzinski after only one season. Pettine was a relatively late entrant into the Browns' exhaustive look for a new leader, but we believe he's an excellent choice. Pettine's defenses in New York and Buffalo were creative and difficult to prepare for. His Bills squad finished fourth in FootballOutsiders' 2013 defensive metrics. The Browns have a ton of talent on defense, which is suited to Pettine's 3-4 background. Then again, the issue in Cleveland wasn't defense last season. Pettine's offensive coordinator hire could make or break his tenure, not to mention the job security of CEO Joe Banner and general manager Michael Lombardi. Browns fans might be underwhelmed by the selection, especially after a search that included mostly offensive names. NFL Media Insider Ian Rapoport reported Tuesday that Denver Broncos offensive coordinator Adam Gase pulled out of consideration in advance of the Super Bowl. New England Patriots OC Josh McDaniels also withdrew his name after meeting with the team. 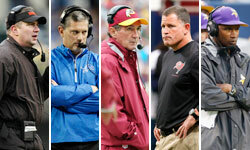 Seattle Seahawks defensive coordinator Dan Quinn previously was expected to meet with the Browns this week, and the team surprisingly had conversations with former Tampa Bay Buccaneers coach Greg Schiano. Skeptics of the move should read the excellent book "Collision Low Crossers" by Nicholas Dawidoff. The book is built around the 2011 Jets, and Pettine comes across as someone ready to run an organization. He's tough-minded, which is going to be necessary for any coach trying to change the culture in Cleveland. Butch Davis is the only coach to take this team to the playoffs since the franchise reboot in 1999, and that brief January was more than a decade ago. Pettine will try to end that streak of futility. If he can't, owner Jimmy Haslam probably won't let Banner and Lombardi get a third swing at finding the right head coach. The "Around The League Podcast" broke down the biggest weaknesses of the Broncos and Seahawks.